The holiday season accounts for a huge percentage of every year's sparkling wine sales. How much exactly, I do not know, but let's assume that it's north of 50% - probably more than 75% if you include Valentine's Day - with the balance likely spread across the summertime wedding/anniversary season. The supply side of the wine business knows this rhythm and stages its promotional efforts around the calendar spikes. 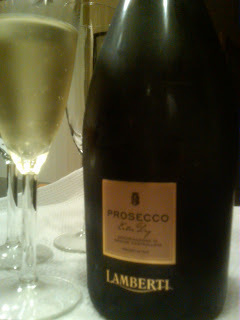 So, it's no surprise that a selection of sparkling wines shows up in the weeks right around Thanksgiving every year. Of the wide variety that ends up in the samples rack, Frederick Wildman's always seems to be the most fun - and deliberately diverse. This year is no exception, with some familiar names and one fantastic surprise. Before getting into the specific wines, a brief digression. Used to be that I never cared for sparkling wine. "Instant hangover", I'd say, and hear echoed from friends and family already too familiar with the day after maladies. But after years of tasting through dozens of Champagnes, Proseccos, Franciacortas, Cavas, and domestic sparklers, I've grown to appreciate this undervalued category of wine. More importantly, I've become a huge advocate of enjoying these wines during off-peak times of the year. Opening the bottle often makes the occasion special and is way more fun than waiting for a day special enough to warrant a celebratory bottle. So, while it's natural to be looking for recommendations on what Champagnes to enjoy at the holidays, these will surely brighten any day. And, thanks to the plethora of low cost/high quality sparkling wine, you don't need to break the bank to pop away the ho-hum routine. Cheers! Expectations are high with this one. Between the elegant packaging and the fact that this was the Champagne served at the royal wedding earlier this year. Stunning looking in the glass. Platinum blond with the tiniest pearl bubbles streaming from stem to surface. Racy bouquet that begs to be tasted. Assertive attack that delivers waves of grace and strength in pure, delicious flavors. Its finish surprises in length and, generosity, and consistency. Expectations met, if not exceeded! As spirited and approachable as an Italian on holiday. Medium-bodied and with lovely balance, this is an easy one to come back to. While the finish if short, it is thankfully crisp and very dry. Ridiculous value. This Burgundian example is made from 100% Chardonnay - and it shows. Even if it isn't from the Champagne region, this is the epitome of French bubbly: refined and elegant. Full flavored with a dab more fruit than most Bruts, there's a lot that's easy to like about this unequivocal crowd pleaser, not the least of which is the price point. Bubbly for wine drinkers. Large bubbles form a frothy head on the pour. Intense and concentrated Chardonnay flavors. Enjoyable, though so strong it'll overpower lighter fare such as oysters. 120 days on lees - and it shows.